Way back in the 1970s Alan Bennett wrote an excellent TV comedy about a couple of office workers. As 9-5 paper shufflers in the North of England their big terror was that computers – which they didn’t understand at all – would steal their jobs. In facts, “computer” was an evil voodoo-style word uttered only in confusion and dread. Fast forward to now and we all have at least two computing devices on our desks most of the time. The world stops when the internet goes down and, rather than creating mass joblessness, we’ve contrived to use these machines to create more work for than ever before. There are lots of negatives of course, like frantic hyper-connected isolation, but redundancy isn’t one of them. Yet our fear of computers – now rebranded and personified in robots and AI – has remained consistent. It is almost as though, in a world of science and information-at-your-fingertips, computing is humanity’s valve for apprehension of the unknown. And the whole thing is so mysterious. Even the terms robots, AI automation and machine learning seem to get muddled and interchanged at will just to ramp the befuddlement up a notch, as they’re not the same things. At the more exciting (or sinister) end of the scale are those freakish humanoid robots and the very technical developments in AI technology. Yet this is an awfully long way off at has little to do with the kind of day-to-day reality most of us are going to encounter. At the more pragmatic end of the scale are all the quiet machine learning initiatives. These are basically maths algorithms crunching their way through the kinds of data volumes that no human being could manage anyway. This is tied in with automation and against received wisdom many of these tasks actually create work rather than destroying it. These include setting up new solutions, monitoring them and biggest of all acting on the intelligence they provide. Machine learning – and a lot of automation – isn’t an end itself. A lot of the time it is merely a stepping stone to more involved and convoluted avenues of work. The constant vendor plea that this frees up human time for more “interesting tasks” might be a little optimistic but it is certainly true that more revenue streams will develop alongside more sophisticated computerisation. Either way, ordinary office workers have cooperating with machines for decades. My laptop is definitely a right hand man I couldn’t do without. And a lot of people would happily describe their mobile phone as an actual friend. Why is the concept of slightly better robotic helpers such a difficult stretch? I think part of the part of the problem is that the terms awarded to a lot of new technologies are misleading. 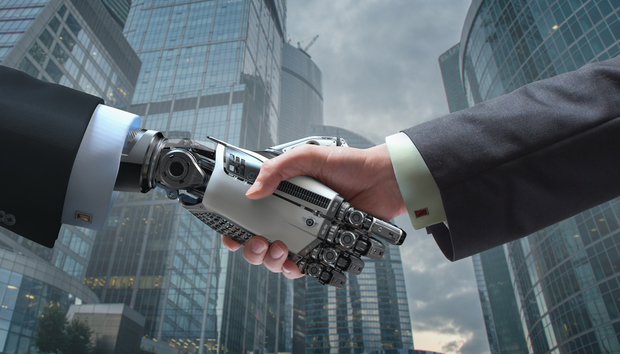 The interchangeability between AI, machine learning, robots and automation is one thing. But then there are other areas like “driverless cars”. These cars are not like Stephen King’s Christine operating fully under their own steam. They’re just a step more automatic than the ones we have already. Everything has to be plotted out in advance and a driver still has to be there ready to leap in when need be. Science fiction has been fascinating people for a very long time. Many of the things predicted have come true to a certain extent. Yet things are rarely as exciting or dystopian as they’re made to sound before they happen. We all work with computers. We’ll continue to work with computers. They’ll get a bit more sophisticated and broaden their skillset. But it won’t be so different. They’ll still be machines, they’ll still have failings. And just like human colleagues really none of them will be able to do everything.